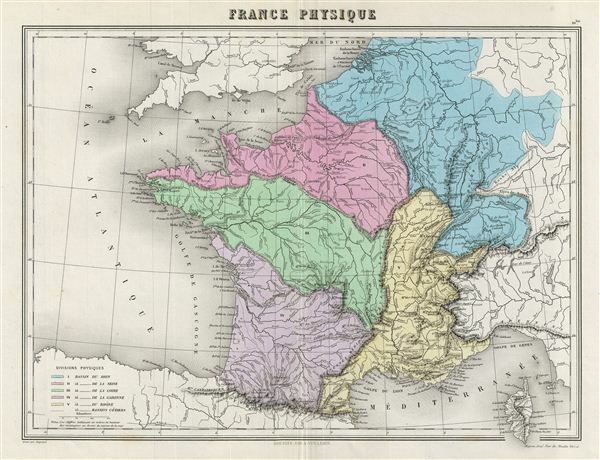 This is fine example of the 1878 Migeon physical map of France. The map covers all of France detailing its various basins including Rhine, Seine, Loire, Garonne, Rhone and its coastal basins. The island of Corsica is included. Migeon identifies various rivers, gulfs, mountain passes, lakes and other topographical features. Migeon's Geographie Universelle, published in Paris, is one of the last great decorative atlases of the 19th century. It contains many stylistic elements of early 19th century cartography such as full hand coloring, numerous decorative vignettes, and high quality paper. This map was issued as plate no. 10bis in Migeon's Geographie Universelle.